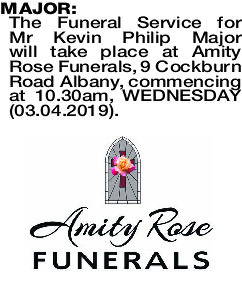 The Funeral Service for Mr Kevin Philip Major will take place at Amity Rose Funerals, 9 Cockburn Road Albany, commencing at 10.30am, WEDNESDAY (03.04.2019). 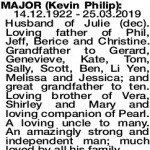 14.12.1922 - 25.03.2019 Husband of Julie (dec). Loving father of Phil, Jeff, Berice and Christine. Grandfather to Gerard, Genevieve, Kate, Tom, Sally, Scott, Ben, Li Yen, Melissa and Jessica; and great grandfather to ten. 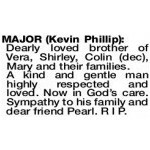 Loving brother of Vera, Shirley and Mary and loving companion of Pearl. A loving uncle to many. An amazingly strong and independent man; much loved by all his family. 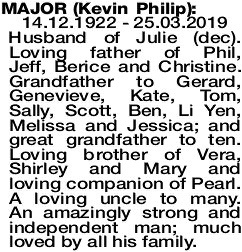 Dearly loved brother of Vera, Shirley, Colin (dec), Mary and their families. A kind and gentle man highly respected and loved. Now in God's care. Sympathy to his family and dear friend Pearl. R I P.